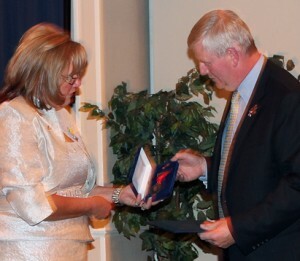 General Rick Hillier was awarded a Hal Rogers Fellow in Red Deer, Alberta on September 16, 2011. Gen. Hillier was presented with the award for his work in rebuilding the image and pride that Canadians have in our Canadian Forces. “Through ‘Operation Connection’ you have awakened the nation to believe in itself and those who protect it,” said Leona Thorogood, Vice President of the Kin Canada Foundation. Gen. Hillier also supports the Military Families Fund, True Patriot Love, Honour House, Ottawa Food bank, Camp Maple Leaf and Soldier On. “You have taught us to be proud of our ‘sons and daughters,’ to raise the bar and the level of respect that we show our soldiers, sailors, airmen and air women; all the values that we as Kin hold as important in our Association,” said Thorogood.